Kilimanjaro is the highest mountain in Africa (5895m), and one of the largest volcanoes in the world. It also is the largest single free-standing mountain mass in the world, rising 4877 meters above the surrounding plains. Kilimanjaro has two peaks: Kibo and Mawenzi. It's a natural heritage site since 1987, because of its exceptional natural beauty and its rare and endangered plants and animal species. Vegetation types vary from low to high altitude: montane forest, moorland, upland moor, alpine bogs and alpine desert. Kilimanjaro is mostly known for being the highest mountain in Africa, and for being one of the most accessible high ones to climb. My visit however was a day trip only. I did a hike to the Mandara hut, the first "station" of the climb. I went with a group of 4, accompanied by 2 local Chagga guides (aged 53 and 64). These men (brothers) had been up and down the mountain all their lives, so they were knowledgeable guides and good companions. The entrance gate to the National Park is located near the outskirts of Marangu town. There we first had to register and pay (60 US dollar, only by VISA credit card). The trail up to the Mandara hut is 8.2 km long and goes up to 2700m. It entirely leads through thick forest. The path is well marked and looks relatively flat. But in reality you're climbing during the whole stretch. This thick forest with many high trees also means that you are well hidden from the sun. Monkeys are seen occassionally along this path, but all we did hear were birds and the cracking noises the trees make. The guides pointed out some of the flowers - colourful little things amidst the dark green, light green, olive and hundreds of other kinds of green of the trees and their leafs. We met quite a number of climbers on their way down. Our guides never failed to ask them "Did you make it to the top?" - which invoked a broad smile on many of the European, American and Japanese faces. We also encountered lots of local porters, who seemed to transport whole kitchens on their necks. Sometimes also casually holding some bags of bread in their free hands. After a little more than 3 hours we arrived at Mandara Hut. This actually is a complex of huts. After registering again that we made it there, we had some lunch (that we brought with us) and just hang around taking in the atmosphere. After 1 hour the guides prompted us to return. Dark clouds had appeared, so we tried to get back before the rain started. We walked down relatively easy in 2.5 hours. Now we really felt how steep the path actually is. And one has to be aware all the time not to trample on the rocks and roots that cover the path from time to time. But we made it back safely, signed out at the entrance gate and drank a cold beer with our guides to celebrate this fine day. P.S. : the peaks of Mount Kilimanjaro are often covered in clouds. Your best bet for a good photo is around 7 a.m. I took the large photo above from Marangu bus station around that time. The fourth day (9km) takes you from Barranco camp to Barafu camp at 4.600m and also crosses alpine desert. And then finally summit night! We got up around midnight to start the 6km climb to the arctic ice fields at Uhuru peak at 5.895m, which we reached after 9 hours of climbing. However, what goes up must come down so the same day we descended back to Barafu camp. In principle, it is not allowed to stay at Barafu camp after summiting but taking into account the physical state of one of our group members an exception was made. However, this also meant that on day six we had to go all the way down from Barafu camp to Mweka gate at 1.600m, or a 23km walk. - Physical condition? : we are both mid forties with desk jobs and a normal physical condition (1h of sport/fitness per week and regular walks in the weekends). We did not specifically prepare for the climb. So it’s not necessary to start running marathons, just make sure you are able to walk 10-15km without problems for consecutive days. Also make sure you walk in advance with the backpack/daypack you will use on Mount Kilimanjaro. The climb does not involve any real climbing, only on the Barranco wall you will need to use your hands (but certainly no need for special gear, ropes, ...). - Which route? : there are six (main) routes, but most people use the Marangu or Machame route. As mentioned, we also took the Machame route although except for the Umbwe route this is the hardest route. However, it is also one of the routes with the best scenery and it has an acclimatisation day (day three) where you ‘climb high and sleep low’ thus increasing the chance to reach the summit. Downside is that the Machame route is more expensive than the Marangu route because it’s one day longer and more porters are needed since you sleep in tents versus huts in case of the Marangu route (ps: the four other routes also use tents). The Machame route can also be done in seven instead of six days but we never felt that this would have been an advantage. - Gear? : in our case, tents and sleeping mats were provided by the trekking agency. People who didn’t have their own were also able to rent sleeping bags, down jackets, ... All of this was of good quality. Trekking poles and gaiters are recommended, especially for the descend. In case you bring your own jacket, gloves, ... make sure they are warm enough. During the day even at 4.000-4.500m a t-shirt and light fleece are sufficient (at least end of September) but once the sun goes down it gets really cold, also at lower altitudes. It is something that is rarely mentioned but the nights are very cold since there is only a thin sleeping mat and tent to block the low temperatures so we were glad that we brought enough warm clothing. Summit night is also cold but at least you are moving – just make sure you have clothes that block the wind. Ps: a practical issue we encountered in this respect is that since we brought a lot of our own gear, we were struggeling with the baggage allowance for the internal flights (in casu 23kg per person with Precision Air). We were able to solve this by redistributing to cabine luggage but in case you have to pay for excess baggage it might be more economical to rent e.g. a sleeping bag. - Altitude sickness? : mr. Kbecq had a general feeling of malaise for one day (day two) while mrs. Kbecq didn’t have any real issues. No headaches during the whole trek. Our group consisted of eight people and while everybody had some minor issues (headache, nausea, ...) these only lasted for a short period of time. Except for one person, everybody took Diamox pills. Downside is that it increases the number of toilet visits which is something you want to avoid in the middle of the nigth at -5C°. - Comfort? : speaking of toilets, they are of the ‘hole in the ground’ type and are called five star toilets if they come with a door and lock. Except for a park rangers building, these are also the only buildings you will find in the (Machame) campsites which means no running water, showers, ... We were provided with a bowl of warm water every morning but be prepared to go on for six days without a proper wash. Three liters of clean drinking water was also provided each day (make sure to drink a lot to avoid altitude sickness). - Team? : for our group of eight, there were 24 porters, 2 cooks, 3 assistant guides and 1 senior guide. The guides are well trained in spotting who is having a difficult day and in general looking after everybody. Four guides also meant that in case e.g. 2 persons wanted to go at a slower pace this was no issue since they could have their own guide. There is less contact with the porters since they go at a faster to ensure that the tents are set when you arrive at the next campsite. However, these guys are amazing taking into account that they haul up 25kg every day. Our group of eight was an international mix (UK, US, India, ...) of easy going persons which created a good atmosphere so there were never any irritations, discussions, ... On the contrary everybody was supporting each other in the (common) goal to reach the summit. - Summit night? Is it hard? : yes it is, but we found it doable and never met ‘the man with the hammer’, had to talk to ourselves to keep on going, ... Just take it easy (polé polé) and you should be fine (assuming you don’t run into altitude sickness and/or injuries). Our complete team of eight made it to the summit: 4 people in 8.5h, 2 in 9h and 2 in 12h. This being said, you will also encounter people being escorted off the mountain while they are given oxygen, we saw the rescue helicopter, ... Don’t let this stop you but take things serious as it’s still an expidition at almost 6.000m. Also take into account that while most people mention summit night, there are also other stretches of the route which are tough (the last km to Barafu camp comes to mind). Mr. Kbecq even found the descent on day six harder than summit night (although he’s the only one in the group). - Cost? : tips included our cost was about USD 1.500-1.750 per person but this also included a transfer from Kilimanjaro airport and two nights at a hotel in Moshi (before and after the climb). Guidelines about the amount of tips can be found and in our case it came down to about USD 250 per person. - Conclusion: as mentioned above, comments about a Kilimanjaro climb are mostly limited to ‘you can do it if you set your mind to it’ but we must admit that this is true. Assuming a normal physical condition and no injuries/altitude sickness issues, reaching the summit should be possible. Just take it slow, enjoy the walk and the views! 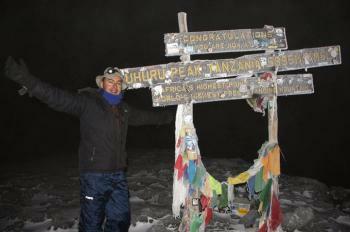 My wife and I climbed Kilimanjaro in March 2011. We used a local company named Zara Tours, who I would fully recommend (it's not permitted to climb Kilimanjaro without guides). Although you have a choice of routes, to maximise our chances of summiting we picked the longest route: Machame. This meant basically five days up, and 1.5 days back down, staying in tents the entire way. This gives you the longest amount of time to acclimatise to the altitude, as hypoxia is more likely to stop you reaching the summit than your legs are. Along the way, you pass through rainforest, alpine forest, moorlands, and eventually the last couple of days it's just a rocky moonscape. Not much wildlife to speak of other than birds and insects. Our porters and guides were great, and we felt in safe hands at all times. The only disappointment was that we arrived on the summit before sunrise, and the heavy clouds rolled in early that day so we couldn't see a thing! 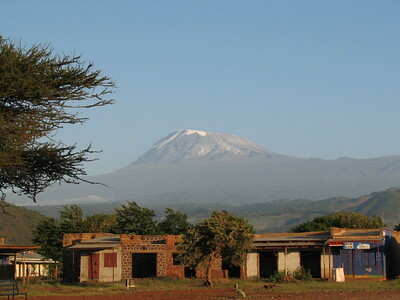 As another reviewer said, if you want to just "see" Kilimanjaro from the base, your best bet is to stay a night or two in the nearby town of Moshi. The summit is usually shrouded in cloud during the day, but is typically clear around sunrise and sunset. You can see more of my UNESCO World Heritage Journey on Youtube, via the link below. If you have just viewed this WHS from “ground level” in Amboseli Park or from Arusha why not try climbing it? It is possible for anyone who is reasonably fit and does a bit of mental and physical preparation. I did it back in 1974 but no doubt it will be much busier, more commercialised and costly now. In those days there was only 1 route – from Marangu. But now there are many to choose from. I can’t therefore comment on which is better. The Marangu is the “classic”, and has huts (whereas the others require camping) but uses the same route up and down whereas others provide some variety! I turned up at the Marangu hotel and made up a group with 4 other tourists there. The hotel arranged the porters etc. I see from the web site that the hotel is still there offering the same services (though the English colonial ladies who ran it on those days have no doubt passed on unfortunately). It is certainly pleasantly located for a stay before and after and possibly more so than a hotel in Arusha or Moshi. We went up without hut bookings but I doubt that that is possible nowadays. Even then the middle hut (Horombo) got over-full as it alone is used on the upward and downward route. “Twende” –“Lets go” - this after the frequent rest stops. It is not a race. There is more than enough time each day to get between the huts so you might as well have plenty of rest stops! “Polepole” – “Slowly”. If you are breathing heavily you are going too fast/hard! So “Go for it!” and good luck! Glaciers: "The glaciers now measure about 0.8 square mile (2 square kilometers), down from 4.6 square miles (12 square kilometers) in 1912." There is considerable debate about whether/how long they will last. 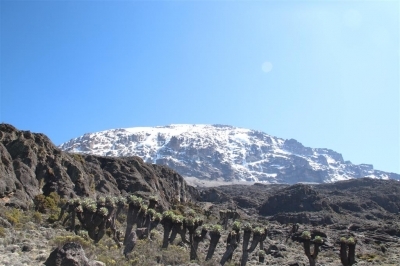 Pliocene: the important thing about Kilimanjaro is the late emergence within the Rift Valley setting – this was largely within the last 3 million years. Foreigner prices: 35 versus 70 USD conservation fee. Residents and East African citizens get the local fee as well. Fatal Accidents or 'disasters': "we estimate the number of people who die on Kili each year to be about six or seven. It should be noted that the study does not include the death of porters, for whom a post-mortem is not compulsory and thus the number of fatalities they suffer is more difficult to quantify with any degree of accuracy."